A spacious screened front porch provides a dramatic focal point for The Delta. Native stone and standing seam metal siding combine with expansive windows to create a traditional style with a contemporary edge. Once inside, the open floor plan is washed with natural light from two window walls in the dining area and large windows on each side of the living room entertainment center. A stone wall enclosed side courtyard provides plenty of additional outdoor living space with room for an optional kitchen and fire pit. The spacious living room can accommodate an optional built-in Murphy bed for guests, with a full bath with shower conveniently located nearby. The first floor master suite offers a dressing area with built in clothes storage and two closets. Large windows overlook the nature trail beyond. 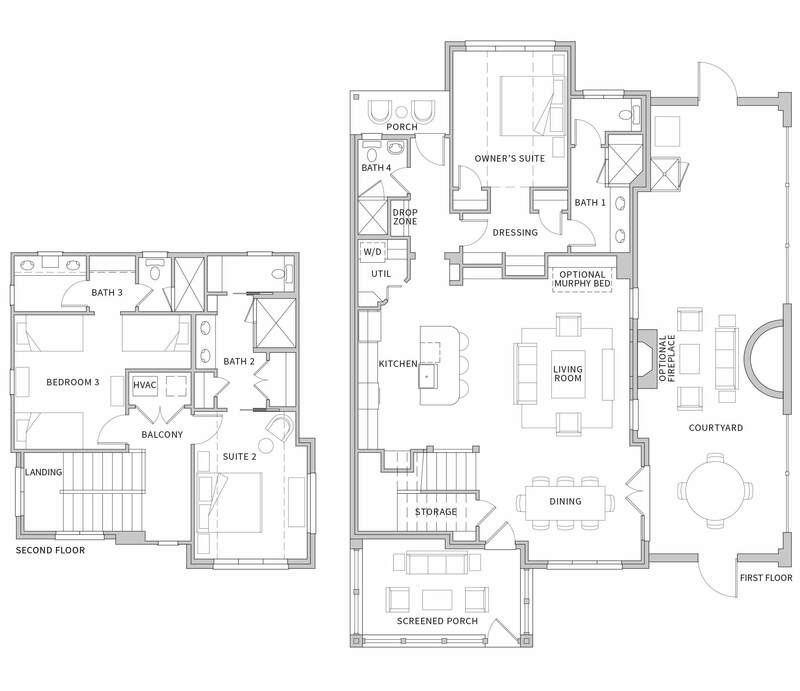 Upstairs, there’s a second master suite with private bath and wide-ranging views through large front windows. Clerestory windows above the bed provide additional natural light. With enough space to sleep six, the large bunk room features a sloped ceiling and compartmentalized bathroom.